Try out this new series of innovative Crazy Catch drills featuring England Women’s star Tammy Beaumont and former England fielding coach Mark Garaway. 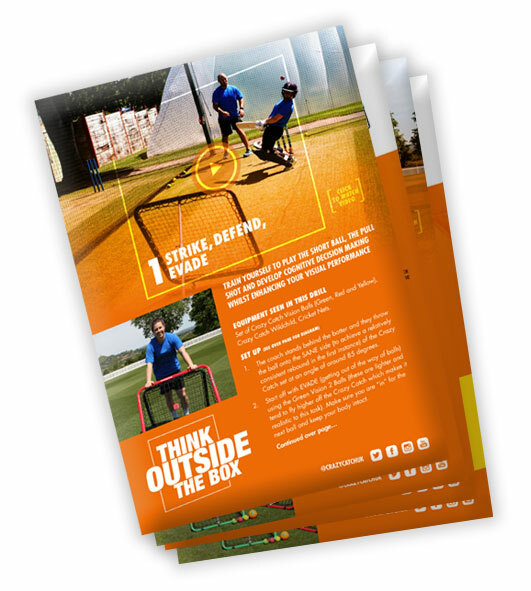 These drills have been designed to use the Crazy Catch to develop different areas of your game, including some batting drills, which incorporate vision technology and develop cognitive decision making. We also showcase both the SANE and INSANE side of the products, which really set it apart as a top training aid, which players of all ages and ability can benefit from using. FOR ALL 5 OF THESE DRILLS FEATURING TAMMY BEAUMONT, INCLUDING SETUP DIAGRAMS, COACHING POINTS & PROGRESSIONS. THE CRAZY CATCH CLASSIC RANGE FOR CRICKET HAS BOTH A SANE AND INSANE SIDE WHEN USED WITH A SMALL BALL. WHILST IT’S ALSO GREAT FOR TEAM GAMES, WARM UPS AND FOR GYM WORK INCORPORATING REACTION TRAINING. “THINK OUTSIDE THE BOX IS AN AMAZING IDEA! “THE CRAZY CATCH FREESTYLE IS A PRODUCT THAT, ONCE YOU HAVE A GO, YOU WANT ONE!